Stand up to big jobs with the only worm drive walk behind concrete saw. Cutting long control joints is simple with the new integrated handle that adjusts to your height and folds easily for transport and storage. Our legendary SKILSAW® worm drive power and a pivoting pointer deliver unmatched precision and convenience. Used wet or dry, the integrated dust management system controls dust for cleaner cuts. A two-finger trigger reduces user fatigue and improves control. The all metal components featuring rust-resistant brackets and fasteners protect from corrosion for longer life. Armed with the MEDUSAW™ Walk Behind, you’ll power through the toughest concrete jobs standing up. 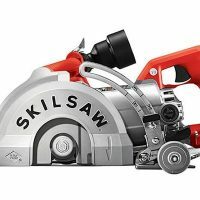 You can always count on SKILSAW®. SPT79A-10 7 In. 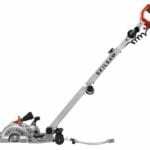 MEDUSAW™ Walk Behind Worm Drive for Concrete, vacuum hose adapter with clamp, water feed assembly, multi-function wrench, side handle and bag. Hose adapter fits sizes 3.5 cm (Euro typical), 1-7/8″ and 2-½” hose ends.